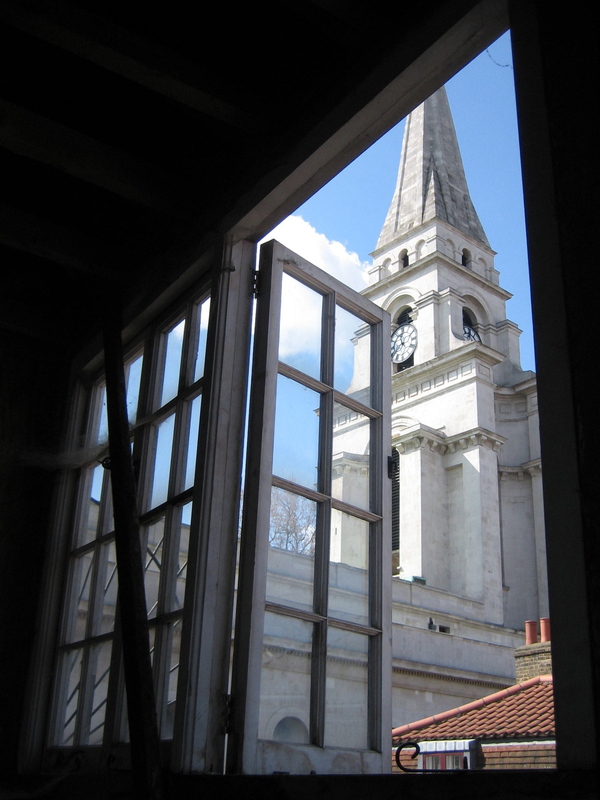 This is the view of Nicholas Hawksmoor’s spire upon Christ Church seen from the weaver’s loft at the top of 2 Wilkes St, the last derelict house in Spitalfields. Once upon a time people used to wander among the streets surrounding the shabby old church, savouring the romance of these ancient Huguenot houses that had seen better days and were then used as workplaces or left derelict. Those days are long gone, since Spitalfields got toshed up, the church was scrubbed behind the ears, the sweatshops moved out, skips appeared as renovations began and the value of these dwellings went through the roof. Today, that process is almost complete, as I visited the last house in Spitalfields to be rescued from decay, where I met Peter Sinden who is overseeing the repairs on behalf of Anisur Rahman who bought the building in the nineteen seventies as a warehouse for his cash and carry business, Star Wholesale. When he bought it, the house had been a workplace for generations with boards nailed over panelling, false ceilings added and layers of flooring concealing the original floorboards. Behind all these accretions, the old structure remained intact and when the additions were removed, along with some of the fabric, in a former restoration attempt no-one bothered to dispose of any of the timber from the house. 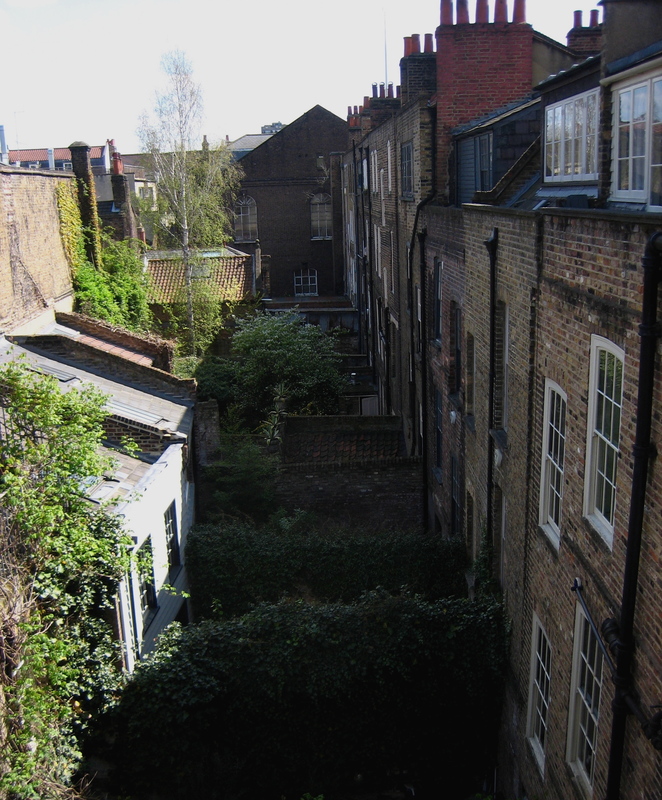 While elsewhere in Spitalfields, properties were being turned upside down, removing all evidence of the previous occupants, Mr Rahman did nothing and, as a consequence of his benign neglect, 2 Wilkes St exists today as an eighteenth century time capsule. Stepping through the door, I was amazed by the multilayered textures that are the result of human activity throughout the long history of the building, especially the flaking paint that reveals every single coat taking you back three centuries. The house has a presence that halts you in your step. It grabs you and you lower your voice without knowing why. You stand and gaze. 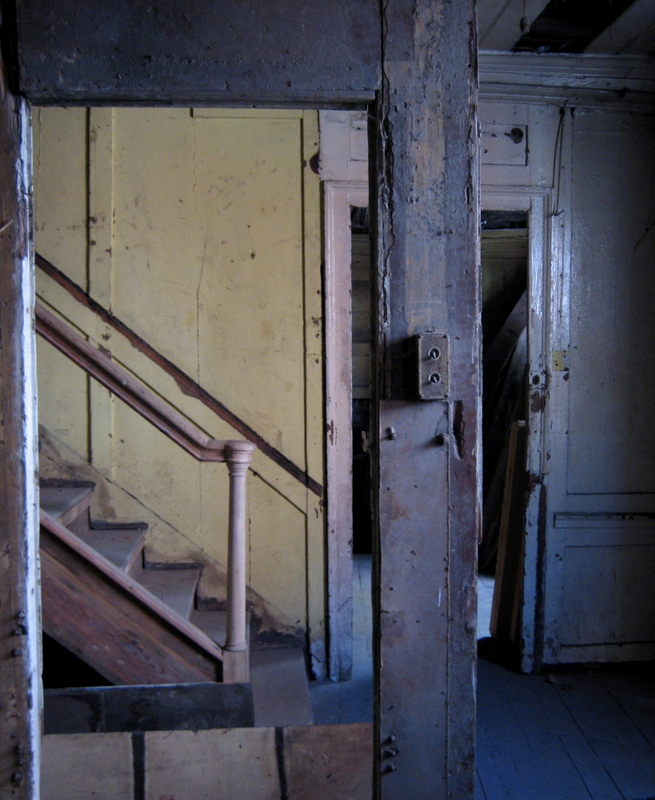 The reflected light from the street falls upon dusty old floorboards, visibly worn beside the windows where people have stood in the same spot to look down upon Wilkes St since the seventeen twenties – when the house was built by Henry Taylor who was responsible for the house next door and several others in the vicinity. Of all the old houses in Spitalfields I have been inside, this is the one that has best retained its atmosphere. All of its history remains present in the dense patina, that speaks of everyone who has passed through. The house retains its own silence and the din of the contemporary world is drowned out by it. Peter Sinden is the proprietor of the Market Coffee House and has brought the expertise that he acquired in the work he did there. His first realisation in Wilkes St was that no timber should leave the house, because all the piles that lay around comprised the missing pieces of an enormous three dimensional jigsaw waiting to be put back together. 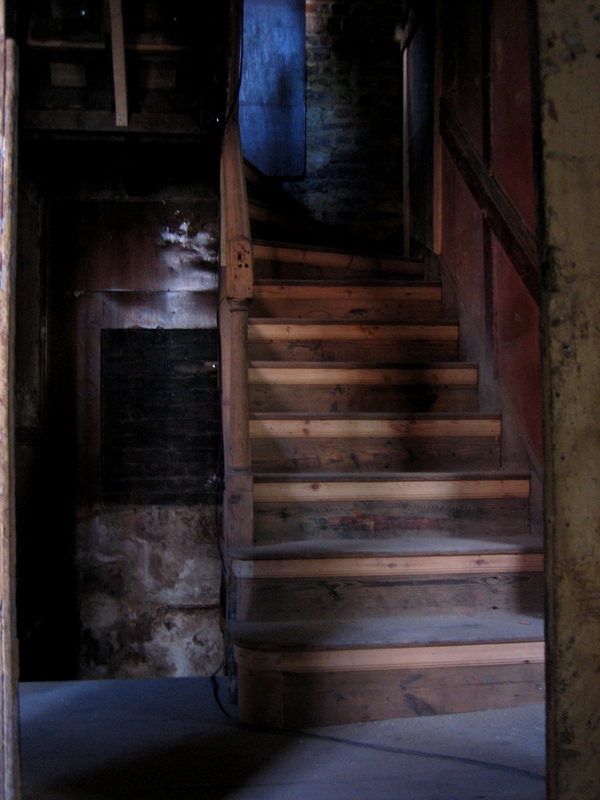 The central staircase of the house had collapsed but he rebuilt it with the original treads, on wooden bearers that support each step, in the traditional method, starting at the bottom and working his way up – just as a joiner would have done in the eighteenth century when all carpenters did their work on site. Today, a staircase would be manufactured offsite on “strings”(which are the side panels used to support the treads) and then reassembled in situ but, by reconstructing the staircase in the old manner, Peter was able to refit it in the way that was most complementary to both the irregularities of the building and the staircase. 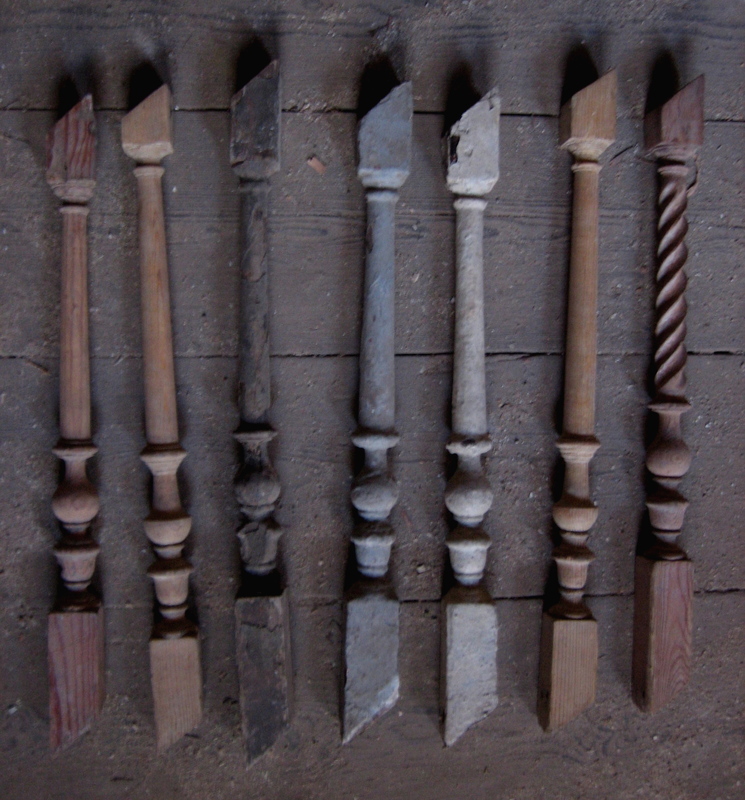 I was fascinated by the few surviving hand-turned stair rods, one sole example with a barley sugar twist for the first flight and others with a simpler profile for the upper flights. These will now be copied to complete the staircase. I could see my own breath in the air as we descended into the dark musty cellar by torchlight, to enter a kitchen where the beam of light fell upon eighteenth century matchboarding and a flag floor, just as I have seen newly installed in other houses at great expense. The torchlight caught portions of an old dresser and a stone sink, beneath layers of dust, grit and filth – presumably abandoned in the nineteenth century – again similar to those I have seen in recreations of period kitchens. Any of Charles Dickens’ characters would recognise this space. 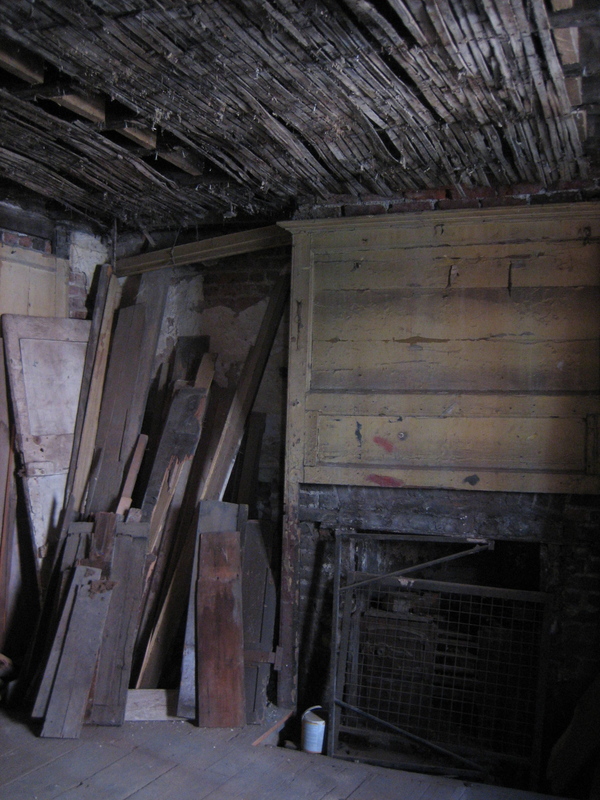 Peter explained that the floorboards above our heads had partly collapsed in the nineteenth century and been shored up, with another floor laid on top to level it up. Inserting new supports, he had lifted the ground floor eight to ten inches back to its original level. Elsewhere he has removed warped panelling and steamed it flat before replacing it. On the first floor, he took me into an intermediary space off the stairwell that linked to the rooms on either side, divided from them by partitions. This was a rare example of a powder room. Any of Henry Fielding’s characters would recognise this space. You will never see a skip outside 2 Wilkes St because Peter’s approach is that of minimum intervention, he speaks of sympathetic repair rather than renovation. Always reusing the original timbers wherever possible, he is treating the project as you would the restoration a piece of fine old furniture. With an open-ended timescale and a sympathetic owner, work can progress slowly. “You take stock, be patient and you let the house speak for itself,” explained Peter, who is undertaking the painstaking work for Mr Rahman without remuneration. “He is a friend and I am trying to help him,” said Peter, talking plainly. Casting my eyes around the house, it was also easy to understand how this project could become compulsively engaging. 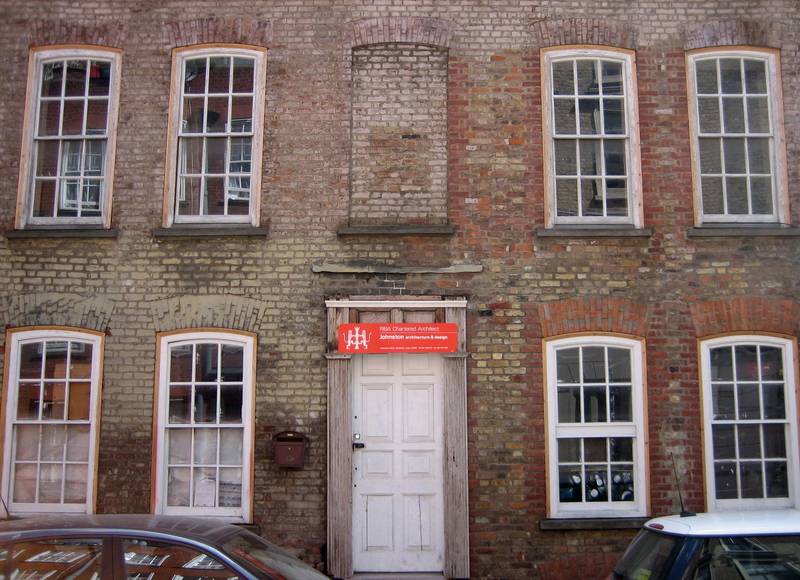 At the recent Annual General Meeting of the Spitalfields Trust, held in the building next door, Douglas Blain, chairman of the trust, spoke of the threat to these old houses in Spitalfields that he sees coming from new money today. Where once in Spitalfields a few enthusiasts renovated their houses, mostly doing the work themselves, now these buildings are a magnet for the super rich who may expect to strip out interiors according to their whims and, in doing so, bear no regard for the subtleties that make them special in the first place. In this context, 2 Wilkes St serves as a timely reminder of the authentic atmosphere of old London that Fielding and Dickens knew, which is incarnated here, witnessing the presence of all our forebears, and which can too easily be destroyed forever. What a wonderful to see inside this house, thanks for sharing this gentle author. I loved looking around even if it was vicariously through your great photo’s! Keep up the good work. I love your blogging. I can imagine sitting at a loom watching the passage of time by the light falling on the spire of Christ Church. Thank you for the evocative and informative text and photographs that perfectly convey the “first do no harm” concept applied to old buildings. Bravo gentle author, for bringing us on this little tour, and to Messrs. Sinden and Rachman for all of your sensitivity and respect for this structure, its history, our history. And putting it’s proper reconstitution ahead of plain old DOSH! I’m going to be in London soon. Annoyed I won’t be able to bring Spitalfields Life to guide me! Unless I spend the next little while printing…printing….printing….! Absolutely fascinating. Mr Rahman is indeed fotunate to have the help of Peter Sinden. He seems very sensitive to this house’s needs. I do love a good time capsule! My favorite was visiting Evergreens in Amherst, Massachusetts, the home of Emily Dickinson’s brother and sister-in-law, right next door to hers. When I went a few years ago, it had only recently been opened to tours and much remained unchanged since the days when Emily visited. 19th century wallpaper was peeling in strips, furniture was cluttered and jumbled, and nothing seemed to have been removed in a century. I kept thinking she saw this, she sat here, maybe she even delivered a parcel of her gingerbread with a poem tied on top. I don’t know what the house looks like today or if they had to stabilize the interior. But I’m glad I visited when I did. A beautiful article about a beautiful house. I so enjoy your writing which is full of many different flavours – it is a true tribute to the special character of the area which you -and i- so clearly love. Interestingly – on this occasion i found that you touched upon a terrible conflict which i feel threatens the very future of Spitalfields – when you mention the comments of Douglas Blain of the Spitalfields Trust. Change is the only constant in our modern world. To survive intact – Spitalfields must embrace change, it must embrace all newcomers -rich or poor- as it has always done – starting with the huguenots fleeing religious persecution back in 1685. I find it very sad when i hear how people who love Spitalfields so much have become blind to this essential spirit and see newcomers as a ‘threat’. They are starting to kill the area with their own kindness – stifling its growth and change, seeking to exclude rather than include. If this continues then the area will be condemned to being a museum of things that once were – rather than a living place. As you say that special atmosphere will – all too easily be destroyed. Thank you very much for writing about our beautiful house that my father has been restoring with the great help of Peter Sinden. It brings a smile to my face thinking what an achievement has been made so far and what is to come! Many thanks for the photos of the house in Wilkes Street. In 1857 my great grandmother was born in number 17 Wilkes Street. Her father was a clock maker. Thank you for sharing the compassion felt for this building. Thank you also to its owner for having the foresight to not allow it to be “done up”, but to be restored faithfully. Does anyone know anyone who knows anything about N o 7 Wilkes Street, please? My grandfather and grandmother lived there in 1877-80. Also, since only half of Wilkes Street remains of what existed in the C19th, can I be sure that I believe to be No7 is actually No 7? Google Maps shows no 7 at the southern corner of the junction with Princelet Street, but is that the No 7 of the late C19th? I visited the location a week ago and there’s no house number 7 now. Kind knowledgable Spitalfielders, please assist! PS Fascinating article, by the way. Thank you for posting this article and photographs and for giving us the opportunity to peek inside this wonderful house. All credit to Mr Rahman and Peter Sinden for this admirabe undertaking. If the street numbering hasn’t changed, then my ancestors lived in this house in the 1830s and 1840s. A widowed grandmother (Ann Ducro – nee Briggs), her widowed daughter (Mary Steward), and her two unmarried daughters (Mary Ann and Ann Martha Steward). It gives me goosebumps to think that they may have sat in these very rooms and trodden the same boards. Based on the 1851 London Census my Grandfather Jacob Isaacs and my Grandmother Annie Isaacs lived and worked at 2 Wilkes Street. He was a master tailor whose 10 children at some point of their lives worked for him. Thanks for sharing these pictures. I am researching my wife’s family history. Her ancestor John Newland and his wife Sarah inhabited part of 2 Wilkes Street in 1861. It was then home to 17 individuals. His occupation was a Hawker. My great grandfather Saul Isaacs Baron and his wife Polly and 5 children lived at no 2 Wilkes Street in 1901 having moved from round the corner from the altogether lower quality accommodation in Princes Street (now Princelet Street). He built up the famous Barons Pickles in Artillery Row in the City, a business well known for their pickled fish and chrayn in particular. By the time of the next census he had moved to the more upmarket Tredegar Square nearby – what a fascinating insight into this property, thank you so much! Interested to see Janelle’s post re Esther Spencer – I am a descendant of Jacob Ruffy at no 7 Wilkes Street who she stole the silver from. I found it on the Old Bailey website ! I too would like to know about Number 7. I had a feeling it was demolished maybe bombed in the war ?? My great great grandfather, on my grandmother’s side, William Hartley was born on 15 November 1806 in Hope Street, Stepney, which I believe was late renamed as Wilkes Street. The baptism register of Christ Church, Spitalfields reads (March) 29 (1807) William Hrtley of William, Currier, Hope Street, by Henrietta, born Nov. 15, 1806. William (Snr.) was originally from Coventry. He returned there shortly after bison’s birth. William (Jnr.) worked in Coventry as a hand-loom weaver. My ancestors the Fosters lived in Spitlafields. My mother’s great-grandparents James Foster printer & Mary Ann Bernard were married in Feb 1837 at Bethnal Green St Matthew. Witnesses were Eliza Leeson & James Flude. In 1840 Eliza Leeson of William St married James Samuel Thwaites, son of Samuel Thwaites & Mary Le Marechal. By 1851 James & Mary Ann Foster had 7 children & Mary Ann was a silkweaveress. Descendants emigrated to New Zealand in the early 1870s. We had cousins in New Zealand, descendants of John James Foster & Sarah Le Marechal, who married in Spitalfields Christ Church in 1816. John James was a silkweaver, born 1793, the eldest of 4 brothers who were weavers. Their parents were William Foster & his wife Georgiana. Georgiana Foster died a widow in Nov 1837 at Thomas St, Bethnal Green, when the informant on the death certificate was John James Foster of Wilkes Street. In the 1850s JJ’s daughter Sarah Geer emigrated to Victoria, Australia. In Nov 1861 JJ’s son James Frederick Foster & wife Elizabeth Pitkin emigrated to Queensland, Australia. They formerly lived in Wilkes St. JJ’s younger son Josiah Foster was a ‘designer for silk’.